SOLANA BEACH — A mixed-use development will soon blossom on the former site of Cedros Gardens, a pesticide-free nursery, after council members at a Dec. 9 special meeting approved the project with a 4-1 vote. Despite changes since the proposal was first presented to council Nov. 16, outgoing Councilman Peter Zahn said he could not support the complex, slated for 330 S. Cedros Ave., because in his opinion it is too large and incompatible with the surrounding area. “This project is by far the largest and most outstanding, in different ways, of all the others in the immediate area,” Zahn said. A proposed tower is “unparalleled,” he added, and the 26,408 square feet of development is the largest in the vicinity. He also cited a lack of “structural articulation” and separation between buildings. “You are creative and you’ve done great things for the city and on that block but this one I just can’t go along with,” Zahn said to developer Sean MacLeod, a 26-year resident and Cedros Avenue business and property owner who helped create Cedros Design District. “I believe in the same, safe, small-town quality of life that we all do,” MacLeod said. “I also believe in supporting our local business districts with the right balance of new, properly scaled projects. “I’ve seen the ebbs and flows of our family of merchants,” he added. “For a while now Cedros Avenue has needed some brisk new energy and new attention to help our merchants remain vibrant and relevant, especially in the face of constant competition from nearby shopping centers and the huge world of e-commerce. “Our driving goal was to devise a plan and a project of detailed excellence that would respond to the wants and desires of the community, bring an exciting new attraction to a quiet midsection of Cedros Avenue, create a welcoming gathering place to foster people connections that enrich the urban village of Cedros Avenue and re-energize Cedros’ entire merchant community,” MacLeod said. The project includes four retail spaces, five office spaces, a full-service restaurant and eight for-rent units on the 41,000-square-foot lot. Based on the lot size, 17 residential units would be allowed. For the restaurant, MacLeod said he is working with The Patio Group, which currently has restaurants in Pacific Beach and Mission Hills. The maximum allowable height is 25 feet, with another 3.75 feet permitted for architectural features. As proposed, about 51 percent of the roof area will take advantage of the additional height to accommodate sustainable building practices, such as solar panels, and mechanical equipment. There will be 78 parking spaces, including 18 uncovered on the northern property line and 60 in a covered area, with 15 designated for the residential units. 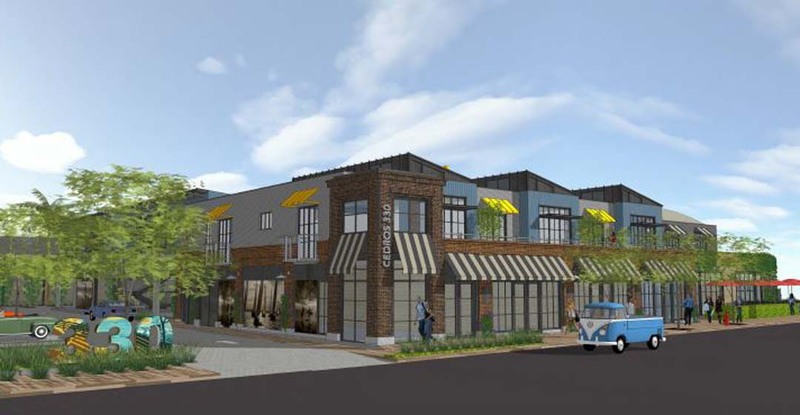 In granting the permits, council approved a shared parking agreement that will allow the retail and office spaces to be used by restaurant patrons in the evening and overflow parking at 415 S. Cedros, a property also owned by MacLeod. No applications for view assessment were received after story poles were installed. More than 20 Cedros merchants signed a petition supporting the project. Mia McCarville, who opened Cedros Gardens in 1993, also sent a letter of support. The project was presented last month but council members continued the public hearing to give MacLeod an opportunity to address some of the concerns raised at that meeting. During that time he reworked the design to remove one second-story balcony, enlarge another, enlarge some second-floor windows and replace striped awnings with flat and angled metal ones for a more industrial appearance. One on-street parking space was also added. Ironically, the landscaping plan on the eastern side of the former nursery, adjacent to the residential area, was an area of concern. Some council members didn’t think what was originally proposed would properly shield the development from the neighbors. MacLeod reworked his landscaping plan and changed some of the tree types. “I’m able to support this project because I do believe those changes that were made improve the project and will be an asset to the street,” Councilwoman Lesa Heebner said. “I think it’s a nice project overall,” Mayor Dave Zito added.